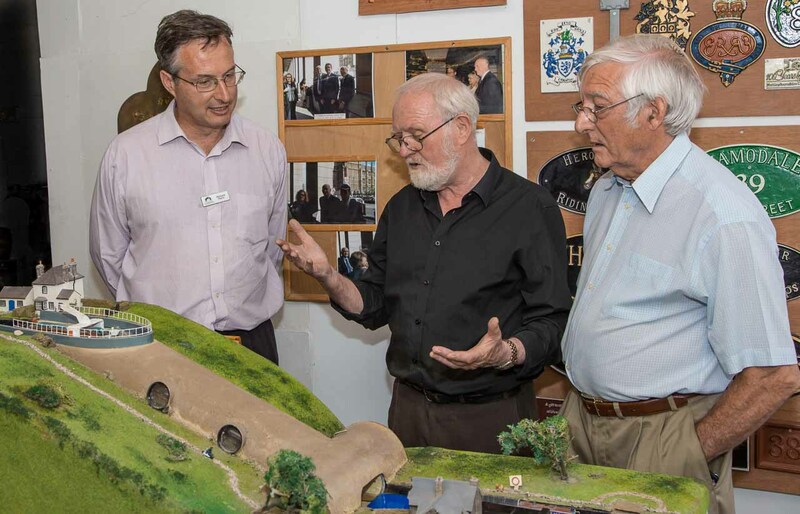 Terry (centre) explains the lock using his model, while Richard (left) and Earle look on. Well, he certainly got out recently when he visited Diagonal Lock inventor Terry Fogarty at Terry’s small business premises in Birmingham. Richard showed keen interest as Terry explained how the Diagonal Lock could operate, where was an ideal place for the first site, and what benefits there were in operational efficiency over a traditional multi-lock system and as a national tourist attraction. 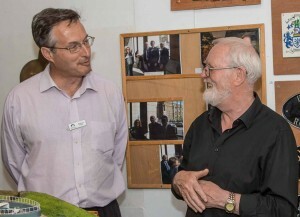 Terry is known as someone who does not spare words to explain his invention but Richard stayed with him for around 90 minutes until Terry finished, and seemed to enjoy the experience. Also present was Earle Wightman, Managing Director of canal business, Sherborne Wharf, and an enthusiastic member of the Diagonal Lock Advisory Group.